I love making a quick, easy smoothie in my Nutribullet, especially when I'm short on time (and who isn't). I've devised this smoothie recipe to specially support my body in pregnancy over the Summer - and to treat some common pregnancy ailments. I simply add all of the ingredients to the Nutribullet and allow it to whizz everything together until smooth. It creates a slightly fizzy slush style smoothie that will provide ideal refreshment in the hotter months. The ingredients were chosen specifically for pregnancy - but are great for pretty much anyone! Blueberries and kiwi fruit are some fruits with the lowest sugar content. It's even more important to keep an eye on your sugar intake in pregnancy than ordinarily, so choosing low sugar fruit, such as berries, is a wise move. 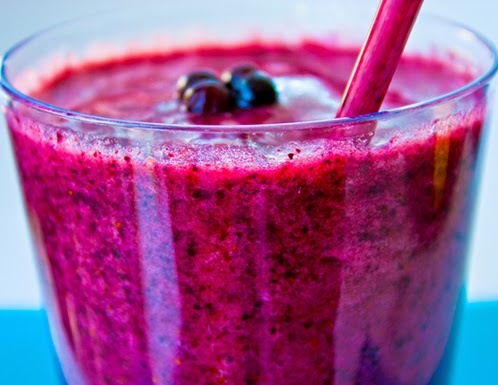 Using frozen berries creates a slushie type texture which is super-refreshing for Summer. Constipation is very common in pregnancy, consuming fruit in liquid form will help to speed up and regulate bowel movement, and soften stools. Studies have shown that women who eat six dates per day in the third trimester, are significantly more likely to go in to spontaneous labour around the 40 week mark, than those who do not. Women who ate six dates a day in their third trimester also dilated (cervix) faster during labour than women who didn't, significantly reducing labour times. Ginger is great for combating nausea, whilst morning sickness usually goes away by about the 12th week of pregnancy, it isn't uncommon for it to return in the last few months (thanks nature!). Tonic water is made using quinine, a bitter tasting anti-inflammatory that should provide relief from the leg cramps associated with later pregnancy. Having a glass of tonic water during the day should prevent you experiencing painful cramps in the evening. You could dress your smoothie with some fresh mint leaves to make it look even more appetising - I just didn't have any!